We believe Cuphea ignea ‘David Verity’ to be one of the best Cigar Plants. ‘David Verity’ blooms prolifically all spring and summer, with beautiful orange 1” tubular flowers that resemble cigars. The Cigar Plant is a large plant, up to 4’x 3’, so give it plenty of space to grow. This Cuphea is a trouble free plant and is great for attracting both butterflies and hummingbirds. 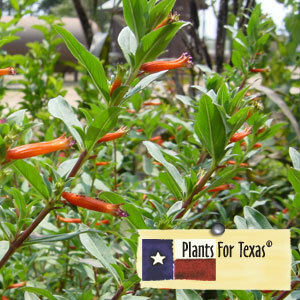 Cuphea ignea ‘David Verity’ is part of our Plants For Texas® Program, meaning it was Texas Grown, Tested in Texas to perform outstanding for Texas Gardens.